Had a conversation with a friend yesterday and they mentioned that they had free passes to a screening of Rango and would I like to join her in viewing the movie. We decided to make a night of it and have dinner afterward as well. 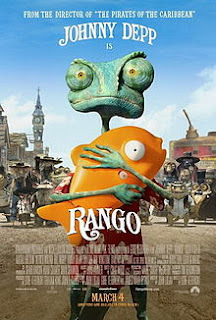 The trailers I saw late last year for Rango were a little strange in that they just seemed to indicate that the movie was a western, and that Rango was this mysterious stranger that comes to town and becomes sheriff to protect the town. My initial reaction was that this could be interesting, and maybe even a little fun. I have a soft spot for animated features so I am usually in line to see them after the lines let up so this movie was obviously going to be on my list of "want-to-see" movies. I was right in the basic gist of the story, but the details were way off. Rango is the story of a pet lizard with thespian tendencies who is accidentally dropped out of the car he is traveling in when they swerve to avoid hitting something in the road. The road happens to be in the Mojave desert, and this leads to all kinds of issues for our protagonist. After an ominous encounter with the very armadillo that caused the near accident, Rango is sent on his way to his destiny somewhere across the blazing desert, along the way we are treated to the music of a band of mariachi playing owls who provide the story and score to lead us on our way through Rango's adventure. I am not going to into the story much more than that, as I find I have a tendency to give away too much if I would try to relate much more than that. I will go into my thoughts on the movie however. I found the animation to be phenomenal, almost as good as live action photography. One scene occurs underground, and the lighting and textures were done with such clarity that it was hard not to believe this was real. The characters were quirky and varied, and played with obvious enjoyment in what they were doing. One hilarious gag that occurs early in the movie, and is in the trailers so I am comfortable I am not spoiling anything, takes place in a saloon that Rango has entered in hopes of finally finding water. He is facing off against a villain lizard who is smoking a cigar and obviously spoiling for a fight. Rango, feeling a little too sure of himself, take the cigar and swallows it. As the cigar starts to burn him the bartender pours him a glass of "cactus juice" which Rango quickly downs and just as quickly, and unwittingly, burps out as fire into the cafe of the offending villain. Watching Rango proceed to add insult to injury as he puts out the accidental fire is both humorous and entertaining. The story was well written for the first half to 3/4 of the movie, but seem somewhat contrived and hurried for the second half of the movie. I wish they had better balanced the gags and story throughout the movie instead I was left with the feeling that they rushed to the surprise revelation and then closure of the story. Additionally, the movie seems to be marketed toward the children, and I would be uncomfortable with some of the scenes as a parent due to language and dark themes. A few scenes were actually a little heavy and dark and could be scary for little ones. Best to have them view it in the safety of your home on cable TV rather than actually paying to have them scared. Overall, this is an enjoyable movie, and I would say go see it for the sheer skill put into the movie, but also know that this is not and Oscar worthy animation. A Great Place to Eat at DIA.